On defense and offense, Wood River junior Rory Cole was the best player on the floor in the first quarter of Saturday’s game against Filer. For three quarters, the 4A Wood River High School girls’ varsity basketball team played evenly with the highly-regarded 3A Filer Wildcats in a non-conference Saturday mati-nee on the Hailey hardwoods. Wood River, aiming to start its season 4-0, jumped to a 7-4 first-quarter lead over the cold-shooting Wildcats behind strong inside play of junior post Rory Cole. Then Wolver-ine shooters went cold in their patient offense for the next 11 minutes—and Filer warmed up in a decisive manner. Filer, last season’s State 3A tournament runner-up, went on an 11-0 run in the second quarter for a 15-7 halftime lead and made it stand up for a 34-22 win that ended Wood River’s early-season unbeaten boast. Junior Kenya Schott (8 points, 5 rebounds), Cole (4 points, 5 rebounds, 5 steals, 2 assists) and freshman guard Blair Radford (4 points) led the Wolverines of coach Matt Ne-whouse. 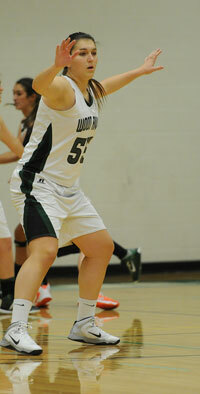 Wood River committed 21 turnovers but mostly han-dled the ball well against the Filer full-court press. Not playing for the second straight game because of a head injury was Wolverine junior Ciceley Peavey, last season’s second-leading scorer. Out-rebounded 8-2 in the first period, Filer (3-1) picked up the pace on the glass in the final three periods and ended up out-rebounding Wood River 23-22. The 12-point final spread might have been larger if Filer (6-for-20) had shot a better per-centage at the free throw line. Filer, with six seniors com-pared to none for Wood River, was led by senior Katie Hughes (10 points, 5 boards, 4 steals), senior Jenna Jarolimek (6 points), 6-3 senior post Sarah Sharp (5 points, 4 rebounds, 2 blocks), senior Anna Williams (5 points) and junior Haley Ackerman (6 points, 2 boards). The Wildcats (21-5 last year), three-time defending district champion for coach Kody Ketterling, had opened their season with 37-27 and 57-47 road wins over 4A Jerome and Can-yon Ridge, along with a 52-23 home loss to 4A Twin Falls. Other Wood River contribu-tors included Manuela Cortina-Otero (2 points, 6 rebounds), Haylee Pettit (2 points), Saman-tha Sutton (3 steals) and sophomore Sara Lichtenberg with her first varsity basket on a nice dish-off by Rory Cole. Wood River hosts the Buhl Tribe (0-3) on Monday, Dec. 2 and then opens its Great Basin Conference schedule Thursday, Dec. 5 against the Minico Spar-tans (1-3) at Rupert. The 3-0 Wood River start was the program’s best since the 2010-11 Hailey squad went 8-0 en route to a school-record 21-3 campaign and second place in the State 4A tournament. Last year’s No. 1 and No. 3 leading scorers Sydney Tidwell and Hannah Belloli, both now graduated, watched Saturday’s Wood River-Filer contest.